Urban revitalization involves redeveloping blighted urban areas for new uses. Urban revitalization has been around since European city planners in the nineteenth century began to consider how to reorganize overpopulated urban areas. Title I of the Housing Act of 1949 kick-started the urban renewal program that would reshape American cities. Urban renewal can have many positive effects, including better quality housing, reduced sprawl, increased economic competitiveness, improved cultural and social amenities, and improved safety. The government has only had mixed success in actually restoring urban areas and has tried to rebrand urban renewal as community redevelopment. eminent domain: (US) The right of a government over the lands within its jurisdiction. Usually invoked to compel land owners to sell their property in preparation for a major construction project, such as a freeway. Housing Act of 1949: The American Housing Act of 1949 was a landmark, sweeping expansion of the federal role in mortgage insurance and issuance and the construction of public housing. It was part of Harry Truman’s program of domestic legislation, the Fair Deal. Urban revitalization is hailed by many as a solution to the problems of urban decline by, as the term suggests, revitalizing decaying urban areas. Urban revitalization is closely related to processes of urban renewal, or programs of land redevelopment in areas of moderate- to high-density urban land use. Urban revitalization has been around since European city planners in the nineteenth century began to consider how to reorganize overpopulated urban areas. However, the modern instantiation of urban revitalization is very much a product of the post-World War II economic and social environment. With the influx of money following World War II, the federal government spotlighted American urban areas as the object of renovation. Most of the postwar development was focused on suburbanization, but urban revitalization was a statutory corollary to suburban development. Title I of the Housing Act of 1949 kick-started the urban renewal program that would reshape American cities. The Act provided federal funding to cities to cover the cost of acquiring declining areas of cities perceived to be slums. According to the act, the federal government paid two-thirds of the cost of acquiring the site, called “the write down,” while the local governments paid for the remaining one-third. Most of the money went towards purchasing the property from the present owners. This process is called ” eminent domain,” or the process through which the government acquires private property for the larger public good. The process of eminent domain requires that the government provide due compensation but does not necessarily require the private property owner’s consent. In the post-war era, after acquiring the properties, the government gave much of the land to private developers to construct new urban housing. These federal incentives to revitalize declining urban areas were particularly attractive to cities that were in states of economic decline at the time. Urban revitalization certainly provides potential for future urban growth, though the story of successes and failures remains mixed so far. Urban renewal can have many positive effects. Replenished housing stock might signify an improvement in quality; urban renewal may increase density and reduce sprawl, and it might have economic benefits that improve the economic competitiveness of the city’s center. It can also improve cultural and social amenities, through the construction of public spaces and community centers, and can improve safety. 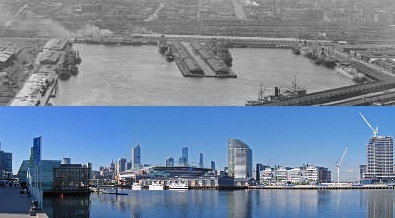 Melbourne Docklands Renewal: The Melbourne Docklands were once a vast expanse of unused docks, but they have now been turned into a residential and commercial development.